Organic Raw Cacao Nibs are a nutritious raw superfood. The nibs are peeled, crushed cacao beans. What benefits are provided by Organic Raw Cacao Nibs? More antioxidant flavonoids than any food, including blueberries, red wine and green tea. Incredibly rich source of magnesium and other essential minerals like calcium, zinc, iron, copper, sulfur and potassium. How do I use Organic Raw Cacao Nibs? Add to smoothies, cereals, and oatmeal or eat by the spoonful. Cacao is a small evergreen tree that is native to tropical Mexico, but now cultivated throughout the tropics. Its seeds are used to make cocoa and chocolate. No. 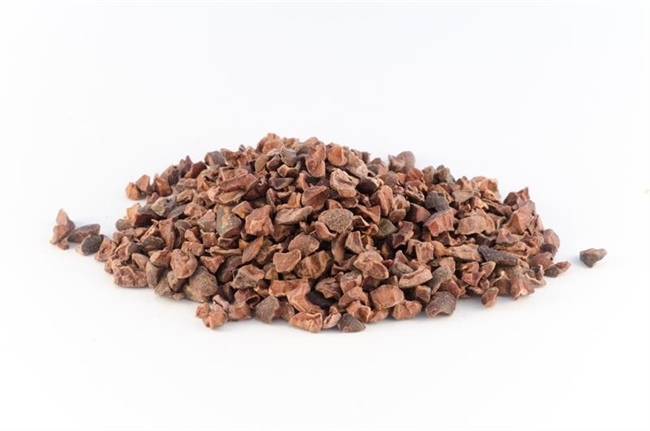 The source of our Organic Raw Cacao Nibs is the premium Criollo variety of cacao. Criollo cacao is the scarcest of the three species of cacao. Criollo cacao has a pleasant taste and mild aroma. Cacao is rich in antioxidants. Studies indicate cacao has twice the antioxidant levels of red wine and three times that of green tea. It’s also important to note that the antioxidants in cacao are very stable and easily available to human metabolism. What is the key nutrient provided by Organic Raw Cacao Nibs? Magnesium helps relax nerves and muscles, builds and strengthens bones and keeps blood circulating smoothly. According to several sources, magnesium is the most deficient major mineral in the American diet with over 80 percent of Americans deficient in magnesium. The body does not produce magnesium, so it must be supplied by one’s diet. What are the other important properties of Organic Raw Cacao Nibs? Cacao Nibs contain many chemicals that may enhance physical and mental well-being. This includes alkaloids, proteins, beta-carotene, leucine, linoleic acid, lipase, lysine, and some neurotransmitters such as dopamine and anandamide (the so-called "bliss" chemical.) It also contains theobromine, which has an effect similar to caffeine. Theobromine stimulates the central nervous system, relaxes smooth muscles and dilates blood vessels. Theobromine has about a quarter of the stimulating powder of caffeine. A key element found in cacao helps serotonin and other neurotransmitters (dopamine, anandamide) to circulate longer in the brain. Monoamine oxidase enzyme inhibitors (MAO inhibitors), a naturally occurring compound, help keep dopamine and anandamide available to the body. Anandamide, the so-called “bliss” chemical, is released when we’re feeling great. The anandamide in cacao helps this brain chemical stay longer in our system and contributes to improve moods. Several studies suggest that cacao seems to diminish appetites. This is probably due to the monoamine oxidase enzyme inhibitors (MAO inhibitors) found in cacao. How is Good Cause Wellness Raw Organic Cacao Nibs processed? It is processed at temperatures below 118 degrees Fahrenheit to ensure the highest nutrient retention. The cacao beans are only partially fermented and are never fumigated or irradiated. The freshly-harvested beans are then cleansed with purified water. The nibs are simply peeled beans that are crushed. How can I use Organic Raw Cacao Nibs? Good Cause Wellness Organic Raw Cacao Nibs are third-party certified and meet USDA and EU 100 percent organic standards. Our Organic Raw Cacao Nibs are also vegan, gluten-free and kosher. They do not need to be refrigerated, but they do keep best in cool, dry conditions.